An instance where this was particularly used was by Blues stay-at-home defenseman Jeff Finley. Known for his willingness to lay back and let Blues defenseman Chris Pronger lead the offensive rush, Finley scored just 13 goals in 708 NHL games, spanning over 16 seasons. He spent six seasons with the Blues and tallied just six goals in that time. None were more exciting than his overtime game-winning goal on Oct. 22, 1999. Forward Pavol Demitra skated to the high slot and found Pierre Turgeon in the left faceoff circle. Where most players would shoot, Turgeon found Finley skating in on goaltender Tommy Salo’s left and sent him a marvelous pass. Finley one-timed it for his first of two goals that season. This was a common occurrence for Blues players. Almost on a nightly basis, Turgeon was feeding his teammates with tap-in goals. In that time, the Blues were an offensive team that relied on everyone to contribute. It was not an out-of-sight incident to see grinders Tyson Nash or Mike Eastwood find the scoresheet. Thus, 40-goal scorers were a rarity. That comes with the exception of 2000-01. Forward Scott Young, whose highest goal totals before that year was 30 with the Quebec Nordiques in 1992-93, found the 40-goal plateau in a season that saw Turgeon rack up 52 assists. The two formed a pairing that rivaled any other team in the NHL, including Jaromir Jagr and Alexei Kovalev in Pittsburgh. Turgeon’s 82 points led the Blues that season, thrusting his team to a fourth-place finish. After taking out the San Jose Sharks and Dallas Stars in the first two rounds of the playoffs, the Blues found themselves in the Western Conference Final for the first time in 15 years. Some would argue, despite three trips to the Stanley Cup Final in franchise history, that this was the greatest team ever assembled in blue, white and yellow. The 2001 Western Final saw the Avalanche take an early 2-0 lead with the series shifting back to St. Louis. After back-and-forth action in regulation of Game 3, it was Turgeon and Young who connected on a memorable play in double overtime. If there was such a thing as the best pass in Blues history, this would be one of the candidates. Turgeon received the puck at the attacking blue line and had Stanley Cup-hopeful Ray Bourque collapsing on him. Turgeon cut a pass across his body and found Young skating in with a head of steam. The pass was perfectly on Young’s tape. He came in on Roy and fired the game-winner at 10:27 of the period for the 4-3 win to cut the Avalanche’s lead to 2-1. The Blues ended up losing the next two games and Colorado went on to win the Stanley Cup. Game 5 of that series would prove to be Turgeon’s last game in St. Louis, ushering in a new era of Blues hope. Doug Weight was acquired in a trade early that summer and Turgeon signed with the Stars. But the sour end to Turgeon’s career in St. Louis had little effect on his memories in the Gateway City. 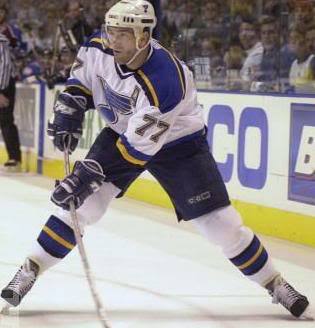 Turgeon’s greatest Blues moment was likely in his third postseason in St. Louis on May 21, 1999. After his team stormed back from a 3-1 series deficit in the Western Conference quarterfinals against the Phoenix Coyotes, Turgeon came up big in overtime of Game 7. Blues defenseman Ricard Persson took a shot from beyond the offensive zone faceoff circle and Turgeon stuck his stick out to deflect it past Coyotes goaltender Nikolai Khabibulin to give the Blues the 1-0 victory with just 2:07 remaining in overtime. That capped off an eight-point first round for Turgeon. Before the goal, he contributed one goal and six assists. Despite playing in just 327 games with St. Louis, which ranks 45th in club history, Turgeon finds himself in the top 10 of many Blues lists. He is 10th in points (355), ninth in game-winning goals (25), sixth in playoff assists (31) and sixth in playoff points (45). He finished his entire NHL career with 1,294 games played, 515 goals, 812 assists and 1,327 points. He currently sits in sole possession of 31st all time in terms of points. The Blues have a large contingency of recognizable names that make their way in to current broadcasts and publications. This list includes Bernie Federko, Brett Hull, Brendan Shanahan, Al MacInnis, Chris Pronger and Pavol Demitra. But the 2000 NHL All-Star selection never seems to garner as much attention. It never seemed to bother Turgeon while he was playing. Chances are, it doesn’t bother him now. The NHL regular season schedule was released on Friday. Check out our partners at TiqIQ for the best deals on St. Louis Blues tickets for all 2013-14 games.